I've been in the Asakusa area of Tōkyō, and now I'm headed south to Kamakura. 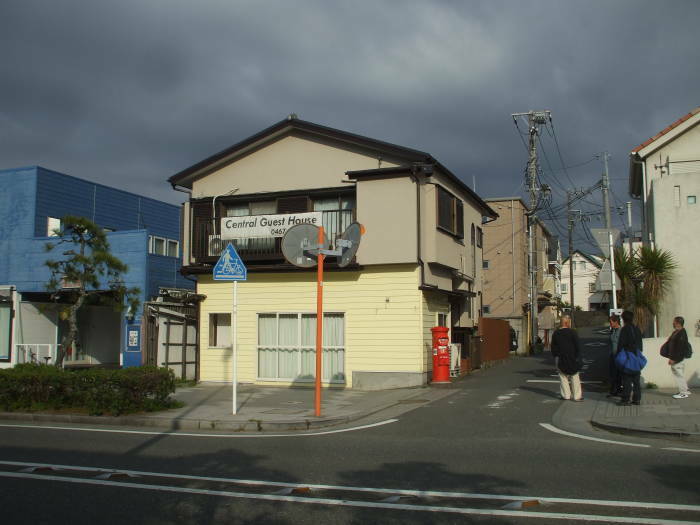 It feels like a small city, really just a town, but it is enormously important in Japanese history. For a while it was the seat of national government and it was the 4th largest city in the world. It has several significant Zen Buddhist temples, and an enormous Daibutsu or bronze Buddha statue. Yes, you could come here on a day trip out of Tōkyō. But stay in Kamakura for a few nights, relax, and take in the wide variety of things to see and do. Kamakura is in Kanagawa Prefecture. 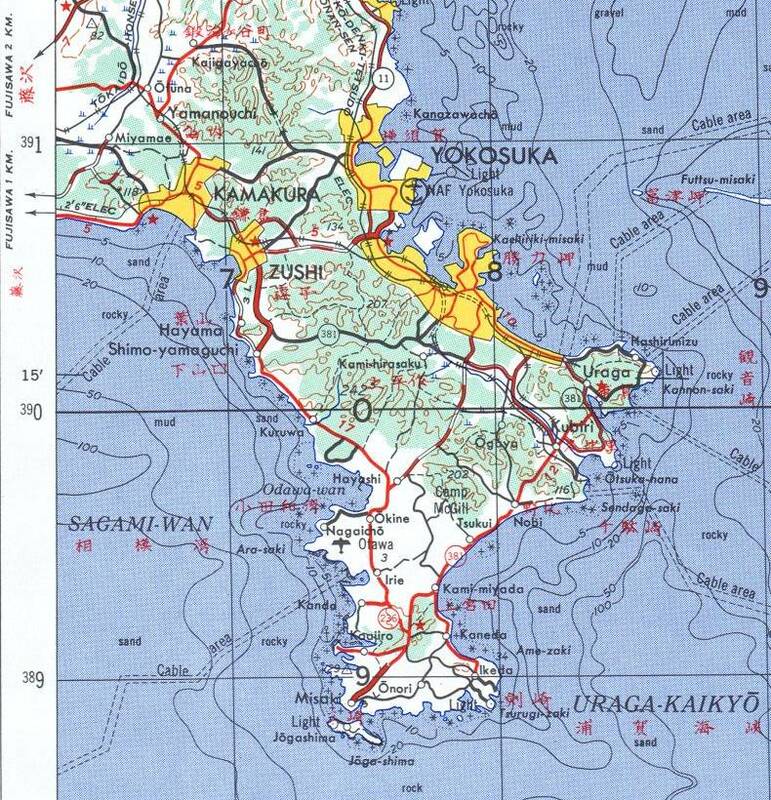 It lies on the exterior side, the southwestern ocean-facing side, of a peninsula on the south end of Tōkyō-wan or Tōkyō Bay. From its beach you look to the southwest, out into Sagami-wan or Sagami Bay. Here is a map with more detail. All these maps are from the Perry-Castañeda Map Collection at the University of Texas. 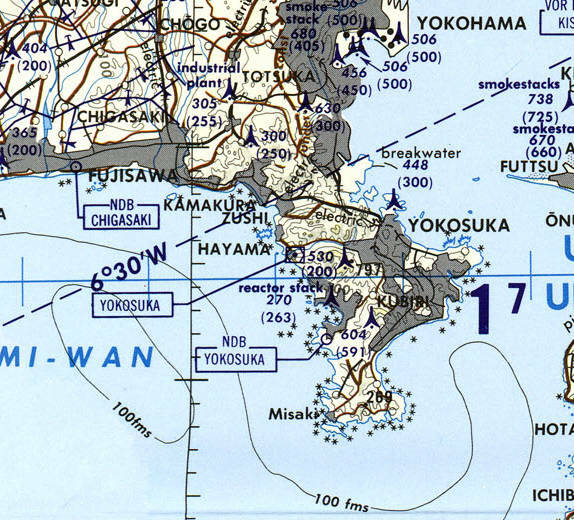 Yokosuka, home of a U.S. Navy base, is over the ridge on the north side of the peninsula facing Tōkyō Bay. Humans have lived here for at least 10,000 years. Researchers have found tools made from obsidian (volcanic glass) and stone dating back to the Paleolithic or Old Stone Age. The area was settled during the Jōmon period, Japanese prehistory of 14,000-300 BCE. 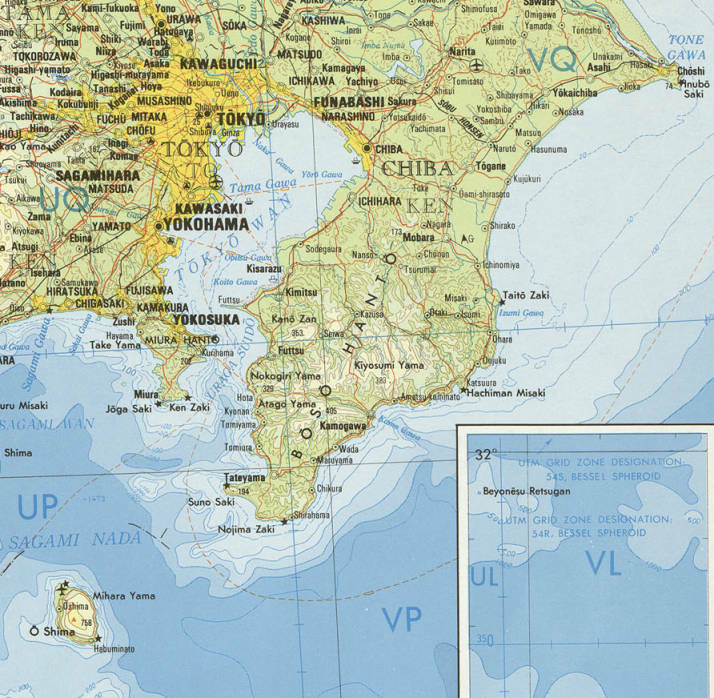 By the Yayoi period of 300 BCE &dash; 300 CE the sea receded almost to today's coastline. The local culture shifted from hunting and fishing to farming. By the Nara period of 710-794 CE, the Kamakura area had both Buddhist temples and Shintō shrines. This was when Japan first started recording its history. Japan was ruled by the Kamakura shōgunate from 1185 to 1333 CE. Minamoto no Yoritome was the first shōgun. This is when the samurai, the warrior caste, first appeared. 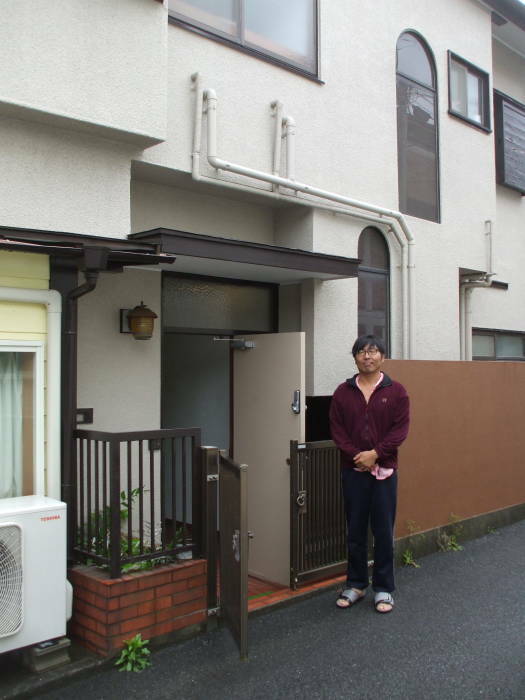 Kamakura now has a little over 174,000 residents. But in 1250 CE it had 200,000 residents. It was Japan's largest city and the 4th largest city in the world. It was home to the "Five Mountains" temples, a network of Zen Buddhist temples that were protected and controlled by the Shōgunate. Kamakura sits in a smaller bay of the Sagami Bay. It is surrounded by a ring of hills and ridges about 100 to 150 meters high. Narrow passes lead through these hills and ridges to the city. 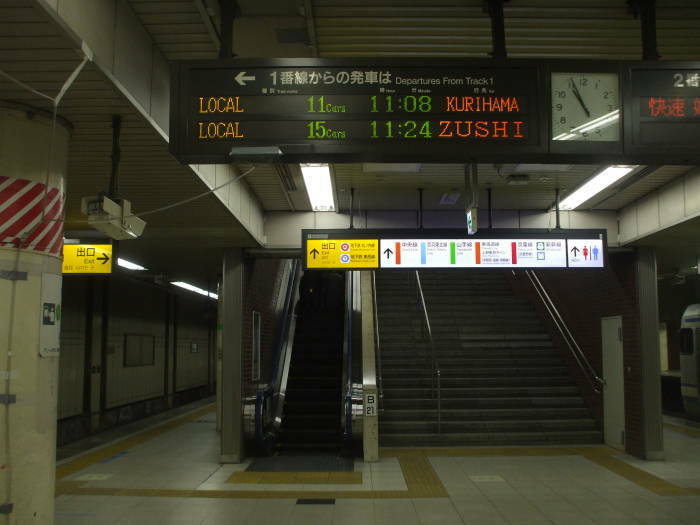 The seven most important passes were called Kamakura's Seven Entrances. On 3 July 1333 CE, the warlord Nitta Yoshisada, a loyalist of the Emperor Go-Daigo in Kyōto, attacked Kamakura in an attempt to re-establish Imperial rule. He was unable to attack by land through the passes. The legendary version of the story is that he threw his sword into the sea as an offering to the sun goddess Amaterasu, believed to be the ancestor of the Japanese Emperors. The sea parted miraculously, clearing a beach wide enough for Nitta's army to march around the Inamuragasaki cape. Science says that there happened to be an unusually low tide on that date. Either way, his forces captured the city. About 900 Hōjō samurai, including the most recent three Regents, performed seppuku or ritual suicide by disembowelment that day at their family temple Tōshō-ji. The invaders sacked the city and burned the temple. Then over 6,000 local citizens followed the example of the Hōjō samurai and also committed suicide. That was followed by period of nation-wide chaos and violence, but Kamakura remained influential. It gradually declined in power and size, and was heavily damaged in battles in 1454 and 1526. Then in 1603 the Tokugawa Shōgunate moved the capital to the nearby fishing town of Edo. Kamakura turned back into a small fishing village. Edo was renamed Tōkyō in the 1860s. 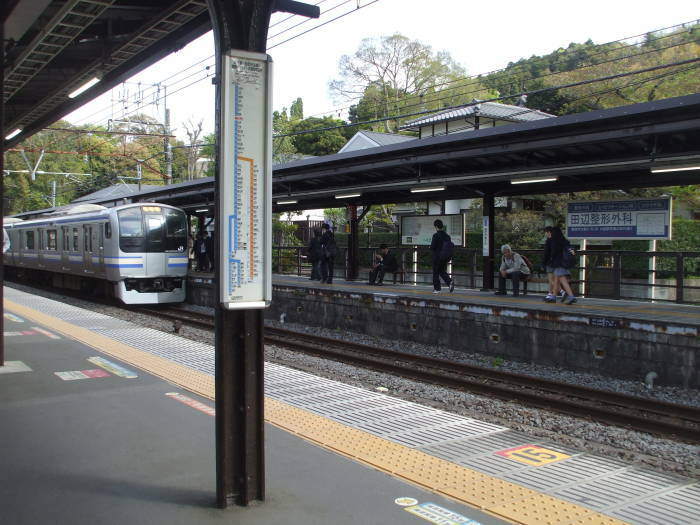 The railroad reached Kamakura in 1890, bringing visitors interested in the history and the relaxing setting. A geography book in 1910 described Kamakura as a small town of 7,250 inhabitants. The Kamakura area is home to the Kamakura Gozan, three of the five highest-ranking Rinzai Zen Buddhist temples. I'm taking the train to Kamakura. 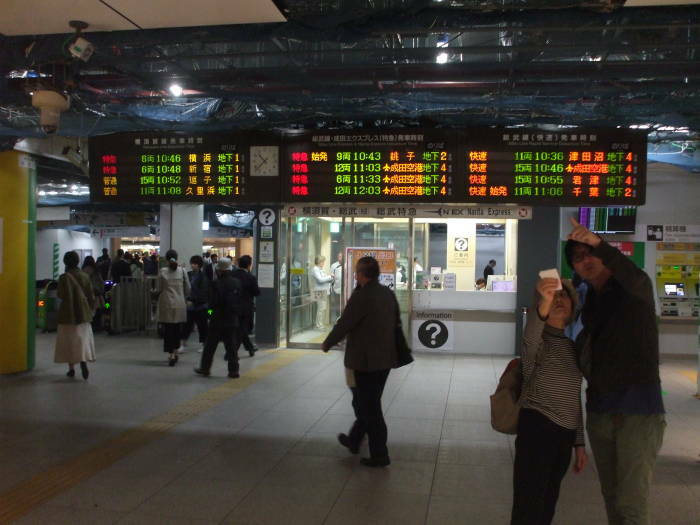 I'm down in Tōkyō Station. 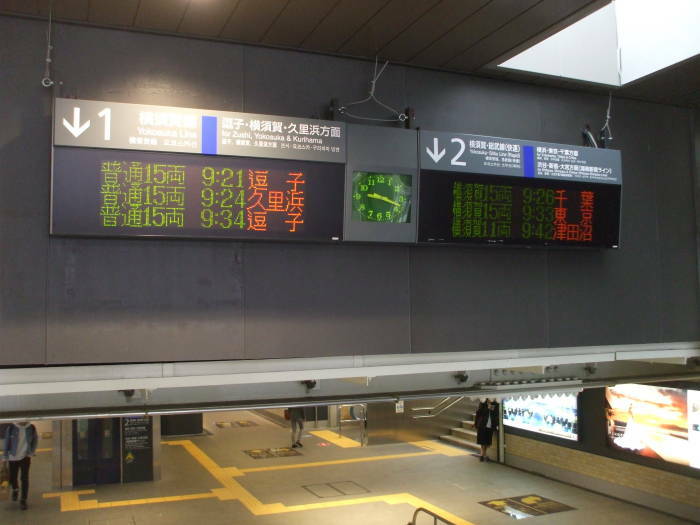 Yes, the electronic signs show details in kanji, Japanese written with Chinese logograms. They cycle through Romanji, Japanese place names rendered with the Latin alphabet. It's a local train, built like a subway train inside. Mostly just standing area, some seats down the side walls. There's no place to sit when I first get on. Things will clear out as we leave the center, as we're heading out of the city in the morning. I had reserved a bed at the Kamakura Central Guest House. 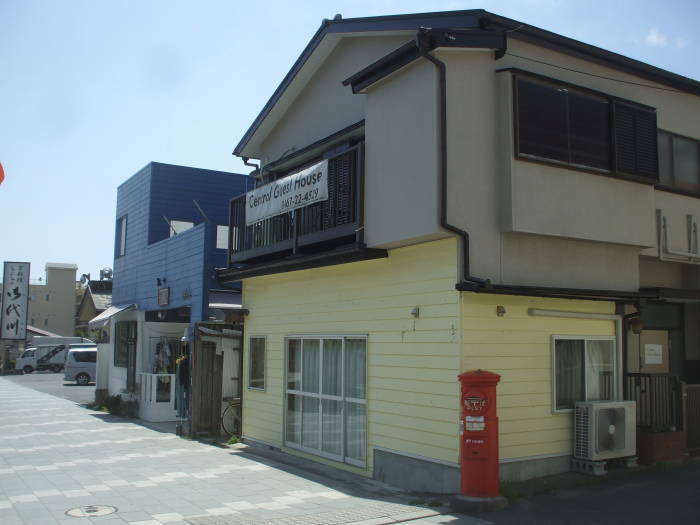 It's at 2 Chome-22-1 Yuigahama, Kamakura, 35° 18.719' N, 139° 32.8' E. Exit the station, proceed out to the main street and turn right, to the south, toward the beach. It's about two-thirds of the way from the train station to the shoreline along the right side of the main street. It's very easy to find. Here it is, with a sign in Romanji and everything! And my host at the side door. 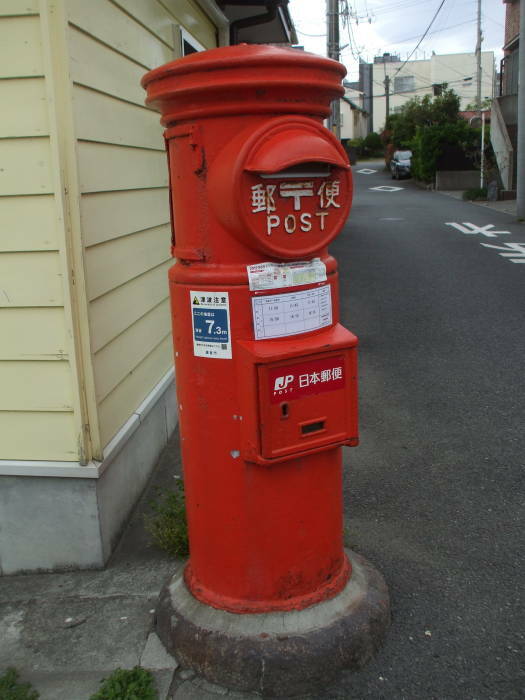 As the tsunami warning sign on the post box says, it's just 7.3 meters above mean sea level. It's not too far from the beach. 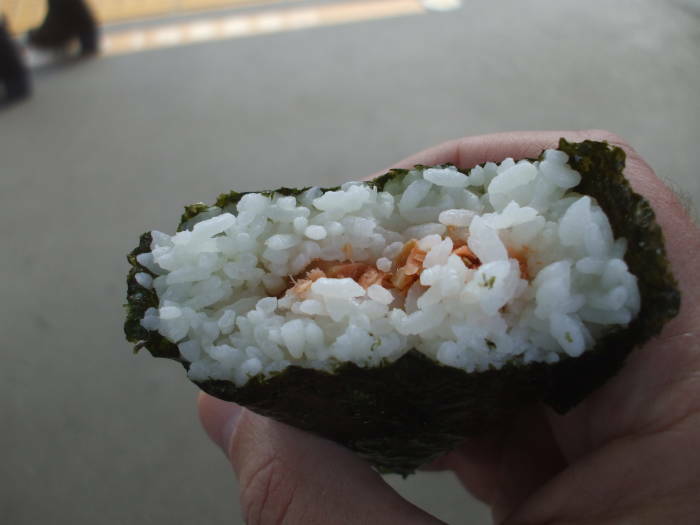 In Kamakura and later in Nara and other stops along the way, I bought breakfast every morning at the train station. In Kamakura, this usually meant walking to the local train station first thing in the morning, buying my breakfast at one of the shops there, then riding to Kita-Kamakura, the next station back in the direction of Tōkyō. 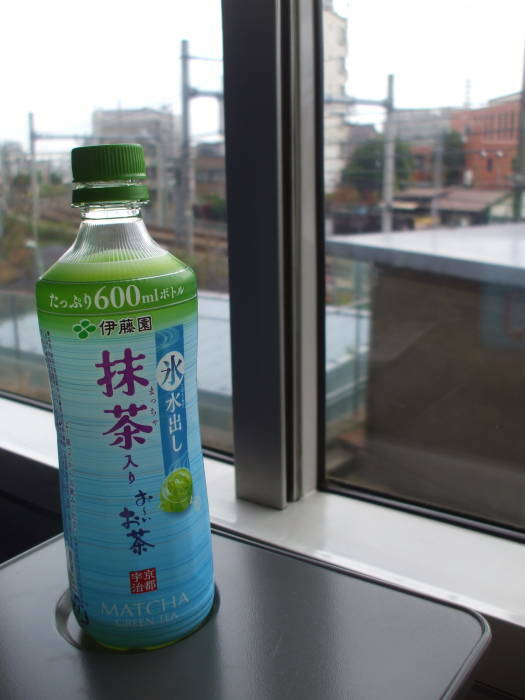 I get off at Kita-Kamakura, sit on a bench on the platform, and have my breakfast. A train stopped in one direction or the other every few minutes, so there was plenty to watch. Then I would start my sight-seeing, working my way back to Kamakura through the day. 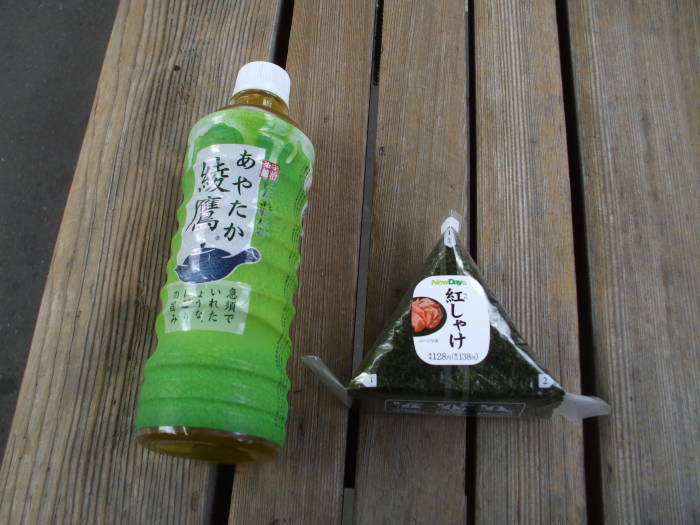 A great breakfast — o-nigiri and green tea! 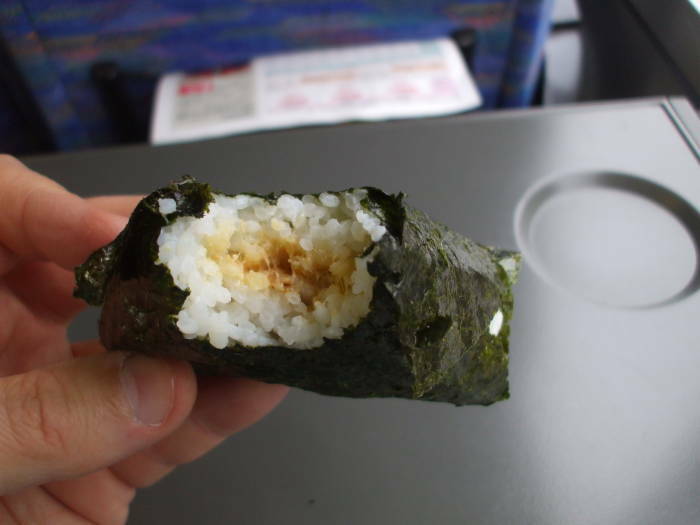 O-nigiri is a ball of rice, typically triangular. 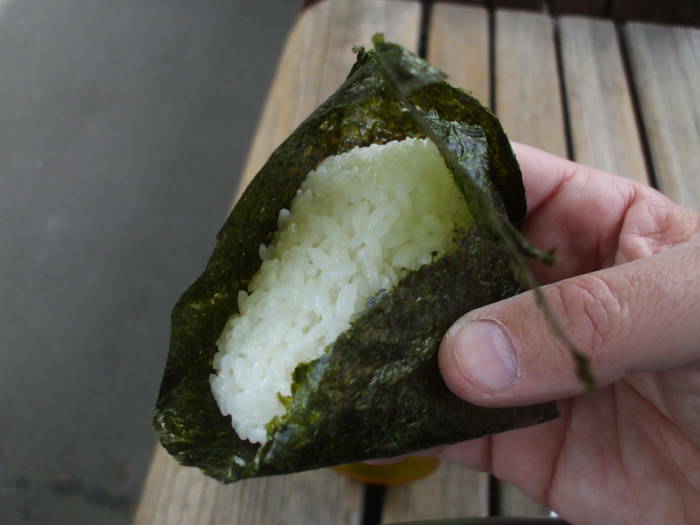 Fish inside, then rice, all wrapped in nori. 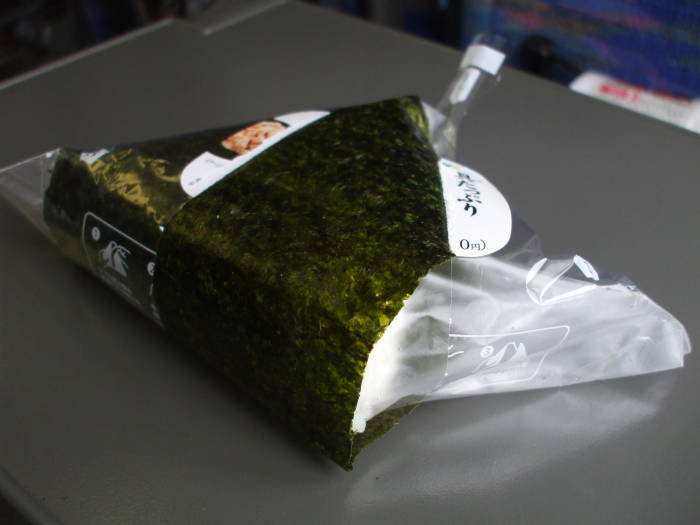 Nori is seaweed. It's the red algae of genus Pyropia, if you're really curious. 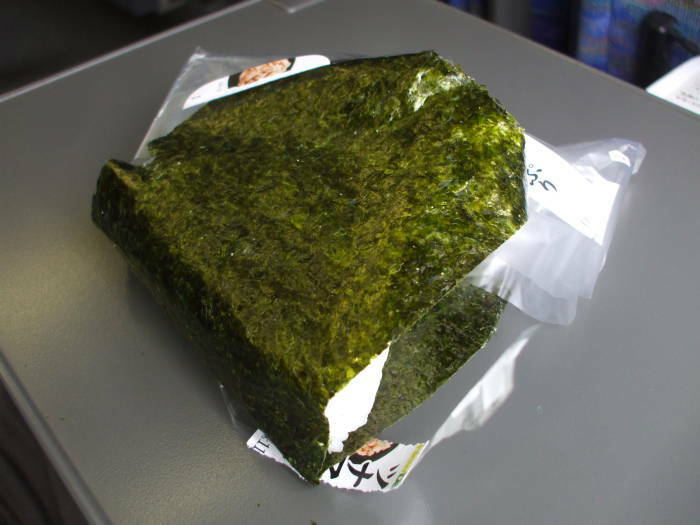 Thin nori sheets are prepared by shredding and rack-drying in a process similar to that used to make paper. It has been made at least since 700 CE as a paste, and since 1750 as paper-like sheets. O-nigiri typically costs just ¥100-120. Some brands have pictures of the original complete fish (or fruit), some have pictures of the contents as prepared, some include the name in Romanji, and some have just the kanji description. The Japanese for "salmon" is sha-ke, しゃけ in hiragana or シャケ in katakana. Or maybe it will be spelled sa-ke, さけ or サケ. That could be confused with the rice wine sa-ke or 酒 in some contexts. 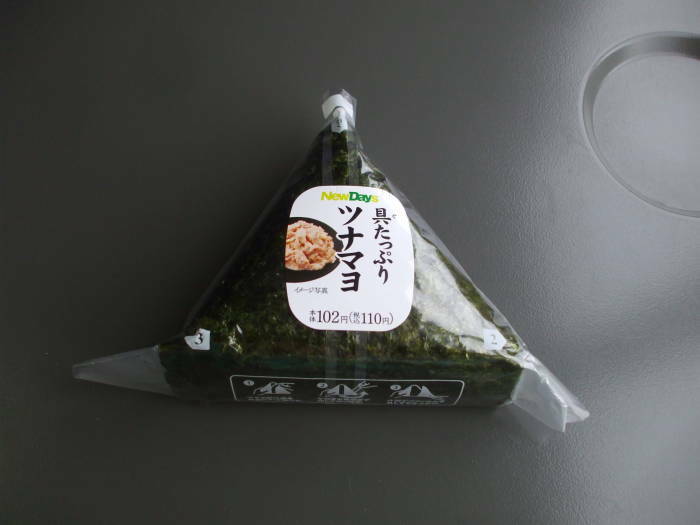 Just look for しゃけ or サケ on o-nigiri wrappers. Or it might be transliterated sāmon or サーモン. Or, if you prefer tuna, ma-ki. But given the choice, I get the salmon. The packaging is ingenious. 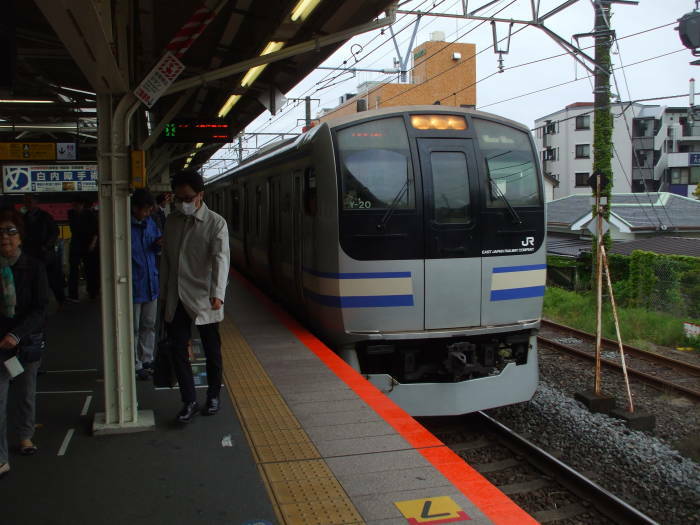 Here's a sequence from on board the train I took back from Kamakura to Tōkyō a few days later. Notice that there are numbers "1", "2", "3" at the three corners: top, right, and left. First, tear "1" down the front, as shown here. There is also a "1" down the back side, do the same there. 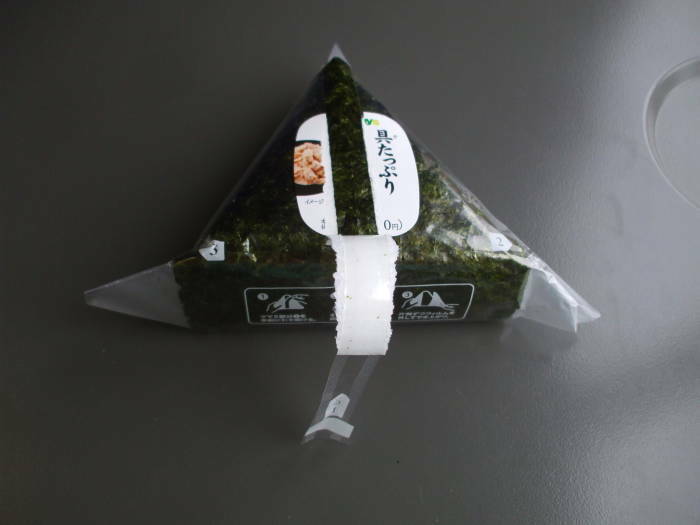 The front and back "1" strips connect, splitting the overall wrapping into two pieces as seen below. Now pull "2" out to the right and up. That pulled off the outer wrapper. 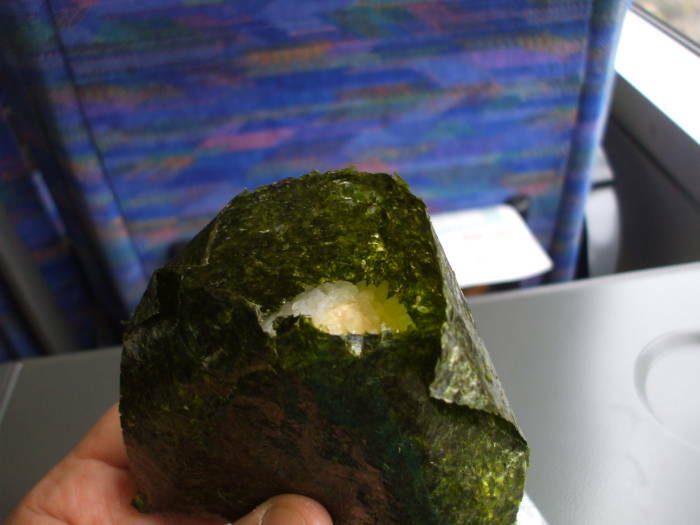 But there was also a thin layer of plastic separating the nori seaweed sheet from the rice, keeping everything crisp and fresh. Then do the corresponding to "3" on the left. 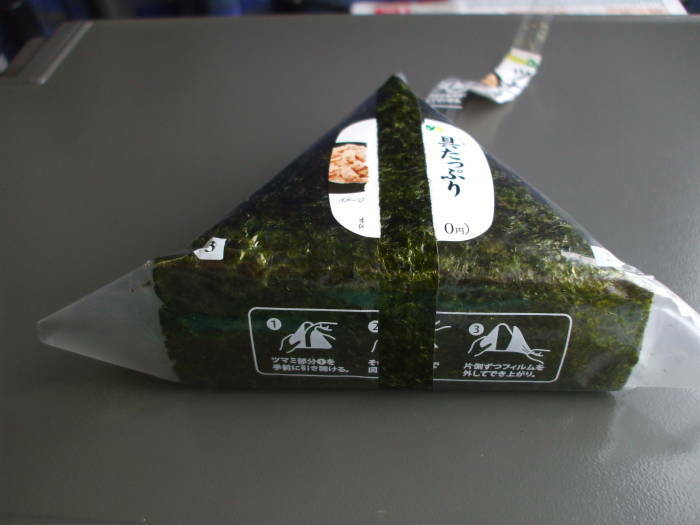 Fold the nori sheet back around the rice. Now you're ready to eat a fresh o-nigiri! Sometimes it would be possible to drive off the side of the road onto the tracks at a rail crossing. Of course that would cause problems. 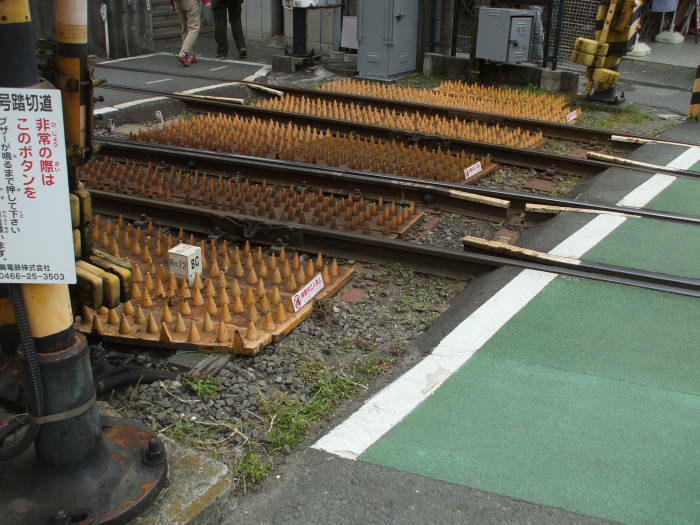 So a series of spikes keeps anyone from driving or walking where they shouldn't. It's Japan, I can't imagine anyone doing something that they shouldn't. But the spikes are here just in case. 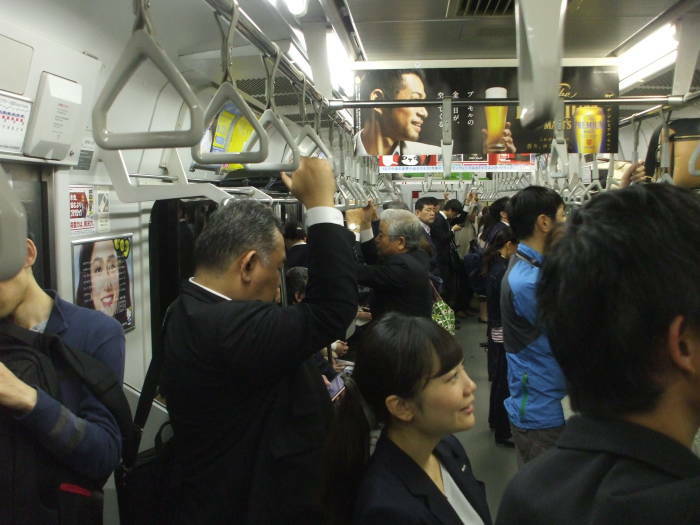 Yes, Japan uses a relatively narrow rail gauge. 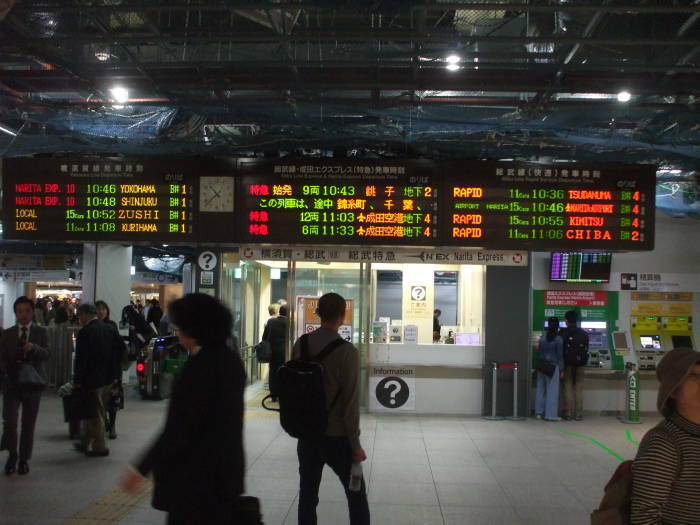 Most of Japan's railroads are built to a 3' 6" gauge, or 1,067 mm, along with Indonesia, Taiwan, Philippines, New Zealand, and parts of Australia. About 55% of the world, including North America, Great Britain, parts of Australia and Brazil, China, and most of Europe, uses 1,435 mm (or 4' 8.5"). 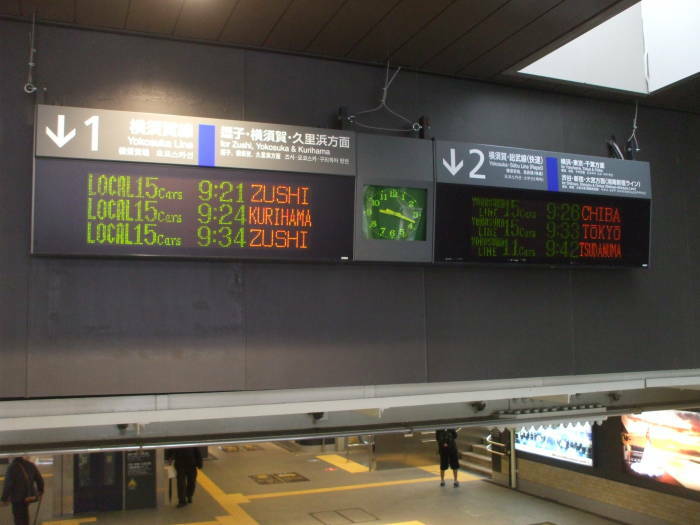 The Shinkansen or high-speed rail lines in Japan also use 1,435 mm. The former Soviet Union plus Finland and Mongolia use 1,520 mm, or 4' 11.84". Security through incompatability, it's harder to invade a large country if your trains don't fit their tracks. 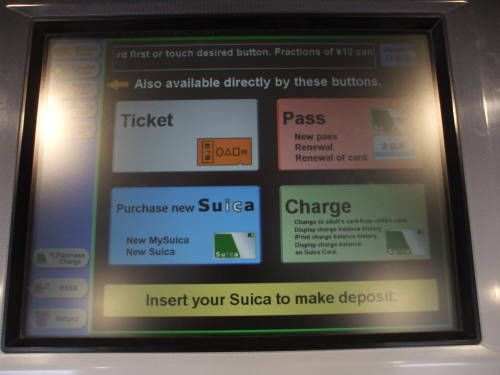 The intercompatible Pasmo and Suica cards are good for a lot of rail travel in Japan. 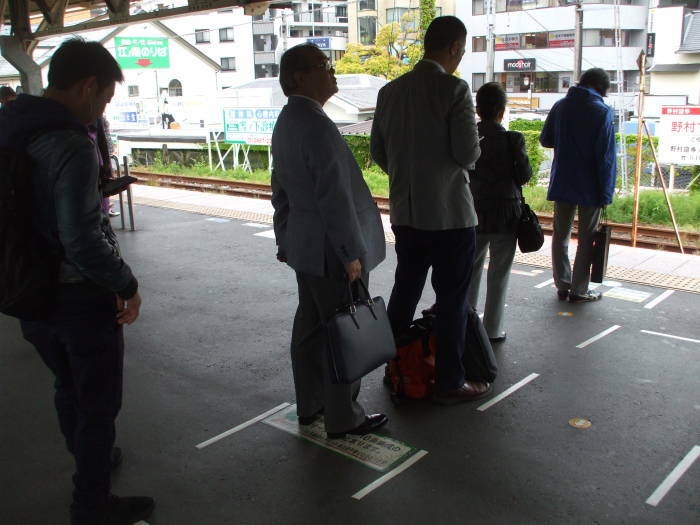 As far as I could tell, they work for any trip on a JR or Japan Railways line other than the Shinkansen. 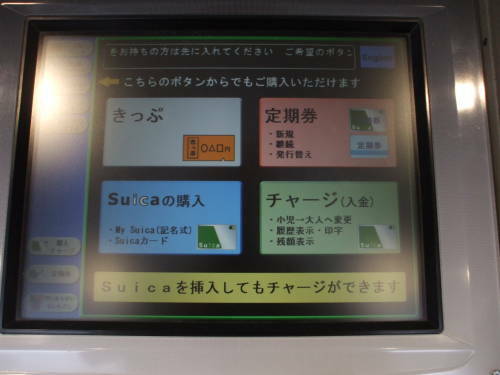 Machines at the station let you see how much credit is left on your card, and add more credit. 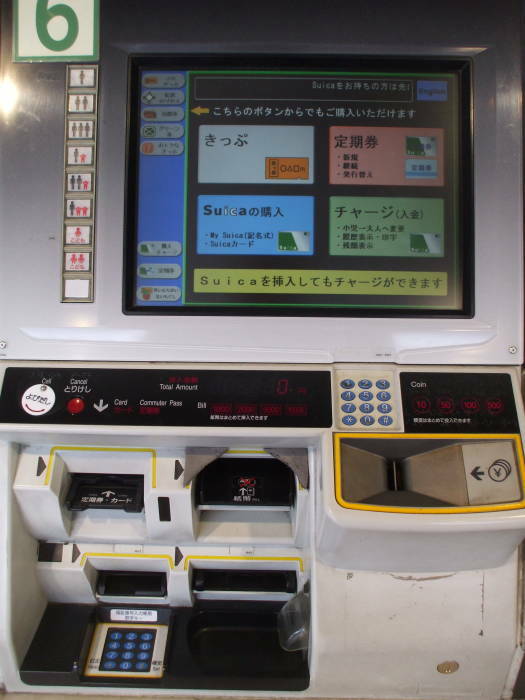 If you are finishing a trip that costs more than the remaining credit, your card is rejected and you go to a machine within the perimeter to add the needed value. You can feed in both bills and coins. Don't worry, there's an "English" button. Here are the next three trains in each direction. 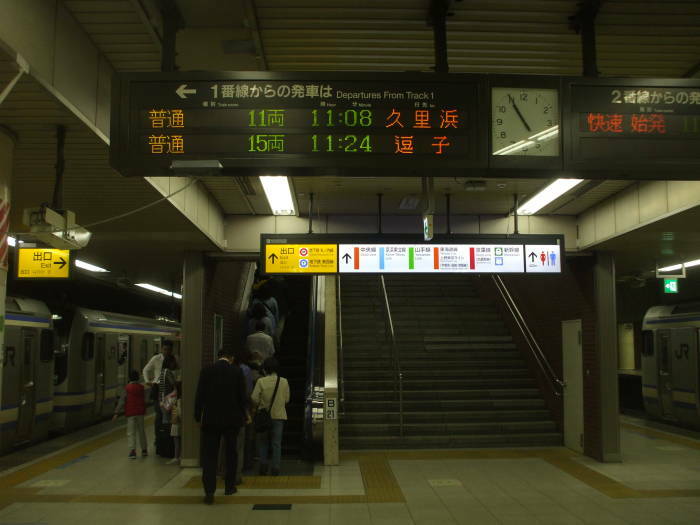 Platform 1 is outbound, from Tōkyō toward Zushi, Yakosuka, and Kurihama; Platform 2 is inbound toward Tōkyō. Yes, there is a train every 3 to 10 minutes in each direction. 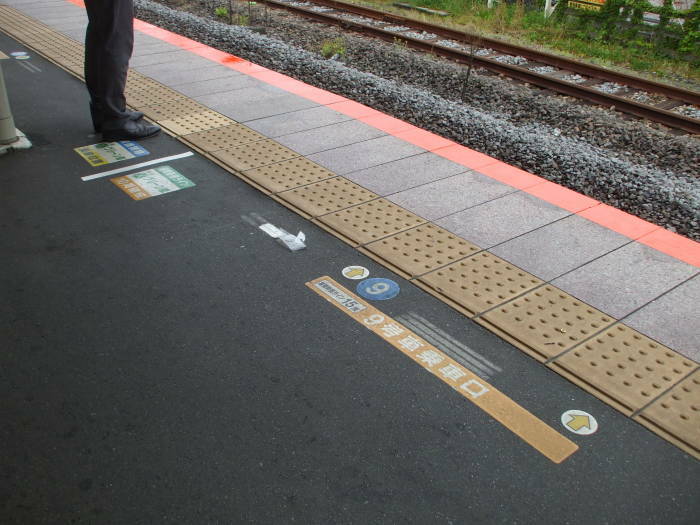 Look at these markings on the platform. Every train pulls in to its precise position. 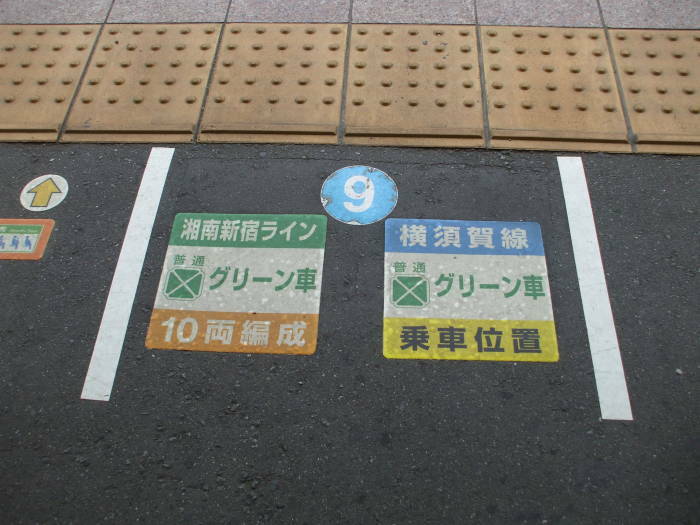 The markings on the platform tell you where the doors will be! 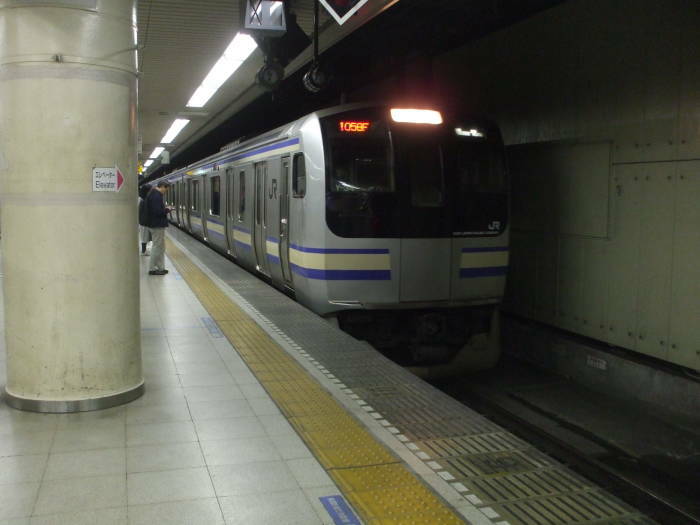 Here comes a north-bound train, pulling into the Kamakura station on its way to Tōkyō via intermediate stops including Kita-Kamakura. The sequence that "tells the story" to me is to work through the various sites in the order I visited them. But follow whichever path you choose.